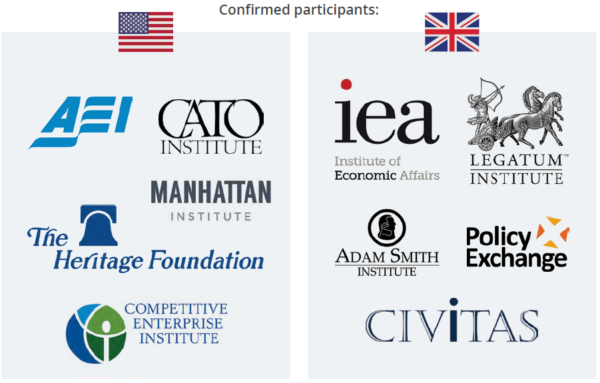 A transatlantic network of conservative think tanks accidentally published its secret plans to influence US-UK trade negotiations, Unearthed can reveal. Documents outline plans to form an “unprecedented” coalition of hard-Brexit and libertarian think tanks, which will call for Britain to ditch strict EU safety standards – including rules on food and pharmaceuticals – in order to secure a sweeping US-UK trade deal. The project plan – which was discovered by Unearthed – claimed the talks would be attended by an official from Fox’s Department for International Trade (DIT), with the aim of making sure the department feels “ownership” of the process. But a DIT spokesperson told Unearthed the department had not yet received an invitation to the talks and so could not comment on whether an official would attend. The IFT said the plan was an “internal proposal document that includes some ideas that have not yet been put into practice. It therefore shouldn’t have been put online.” No US or British government officials have yet been invited, the spokesperson added. The plans, which were presented in a glossy brochure, have now been removed from the IFT’s website – but Unearthed is publishing them here in full. Shadow trade secretary Barry Gardiner told Unearthed: “This looks like another attempt by the IFT to legitimise what is an overtly political agenda by using a government department to sanction their work with right-wing think tanks overseas. There is far too cosy a relationship between some of these organisations and senior Cabinet figures”. According to the documents, the shadow trade talks are set to include 10 leading right-wing think tanks from the UK and US – including the London-based Institute for Economic Affairs and the Legatum Institute, which has recommended dropping in the EU’s precautionary principle to boost trade. Source: Initiative for Free Trade. An IFT spokesperson told Unearthed that Policy Exchange, one of the UK think tanks listed in the brochure, had not yet confirmed it would join the trade talks. On the US side, the American Enterprise Institute and Heritage Foundation are listed as participants. The Cato Institute – which was founded by billionaire oil refiner, Charles Koch – will write the first draft of the “ideal” agreement. Trade secretary Liam Fox has longstanding links to several of the groups involved in the project, and helped launch the IFT – which is run by Conservative MEP Daniel Hannan – in September 2017. Foreign secretary Boris Johnson also spoke at the launch, which was controversially held at the Foreign Office. The IFT’s website boasts of its’ “extensive networks within governments”, which it will “use to promote new trade agreements and to make sure that they focus on mutual recognition”. “These further plans will absolutely throw agriculture under the bus. The bus with £350m on the side”, he continued. 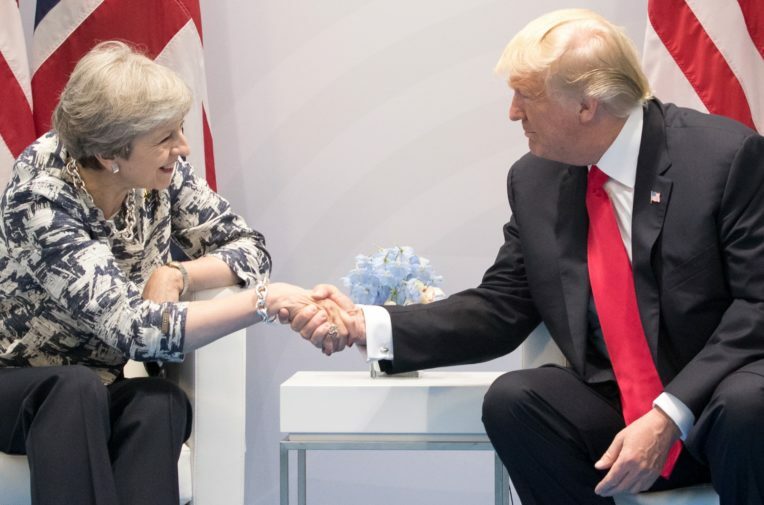 The shadow talks aim to shape the negotiations before they have even begun, the brochure says – producing “a blueprint that is looked upon favourably by both governments” and can serve as something “to work towards in the actual US-UK FTA negotiations”. The tactic of drafting model legislation and ensuring buy-in from government along the way has long been used by US libertarian groups, such as the American Legislative Exchange Council (ALEC). The Heritage Foundation boasts that 64% of the 344 policy recommendations it made in its “Mandate for Leadership” document have been adopted by the Trump administration. The IFT’s plan for the shadow talks says a key goal is “to ensure the blueprint reaches as many of the relevant individuals as possible, including government officials, ministers and legislators”, through the access enjoyed by the think tanks. It added that the presence of UK and US officials will “lend greater weight to our endeavour”. The “ideal” free trade agreement outlined by the IFT in the document could transform the way the safety of imported products – such as food and pharmaceuticals – is regulated. The IFT argues that, by recognising some US standards and dropping some restrictions on the import of US agricultural products, the UK can pivot away from the EU’s precautionary principle, saving consumers money through cheaper food imports. It says a shift away from the EU’s approach would mean that “US exporters of agricultural produce – beef, for instance – would have a brand new market to sell to”. Imports of US beef are currently restricted by the EU because of a widespread use of growth hormones that the European Commission deems unsafe. This type of regulatory change would also allow for imports of chlorinated chicken, an issue that caused huge controversy during Liam Fox’s visit to Washington in July 2017. During an event at the American Enterprise Institute, Fox dismissed the issue as a sideshow: “the British media are obsessed with chlorine-washed chickens, a detail of the very end-stage of one sector of a potential free trade agreement. I say no more than that”. 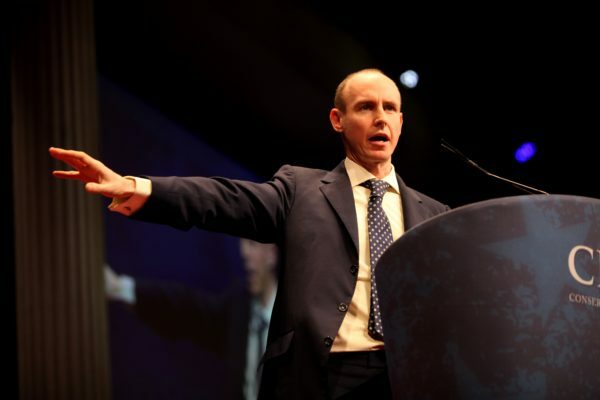 However, documents obtained by DeSmog under freedom of information and seen by Unearthed, reveal that the chlorinated chicken issue was one of the first things Fox was lobbied about when he met with the Heritage Foundation – just a week after his appointment as trade secretary. According to a summary of a July 2016 lunch with 16 representatives of Heritage – including his former special advisor, Luke Coffey: “participants highlighted the political significant [sic] of chlorine-washed chicken (banned in the EU) to US agriculture (COMMENT: a long-standing restriction that the US argues is without scientific basis)”. Unearthed contacted the Heritage Foundation for comment and will update the story when we receive a response.